I was born in Ireland. In 2005 I graduated from The National College of Art & Design with a Masters in Ceramics. My current body of work is inspired by Phyllis Richardson’s writing on architecture. Peter Gran on psychology and Gaston Bachelard’s “The Poetics of Space”. It explores issues of fragility, personal space and memory. 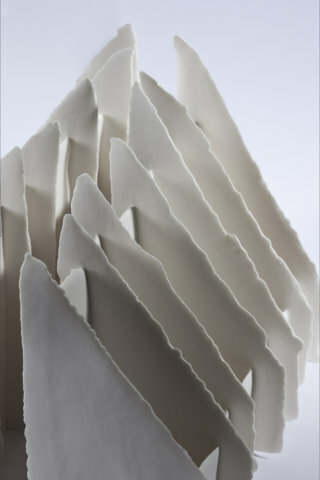 I make delicate porcelain box sculptures and construct miniscule environments, abstracted spaces, cities and houses. These recall the cardboard box houses and other fantastical environments of childhood, the flimsy structures made robust by force of imagination. My work also suggests secret compartments where we can store or hide our memories. It questions the stability and durability of our homes and our environments, the reality of the walls that we construct around us. Viewers are invited to contemplate their own experiences of space, childhood and memory. The box structures are like micro works of architecture. They represent environments for the nurturing of imagination. The walls in these pieces, although somewhat malleable, represent the essential boundaries that define personal integrity. I am drawn to porcelain as a material for its aesthetic qualities and physical properties, its translucent pallor and delicacy. I combine nylon fibres with porcelain slip; this allows me to make work so thin and translucent , a paper like quality is achieved.